Visit Sorrento on a 2-night package and see Capri while you’re at it. 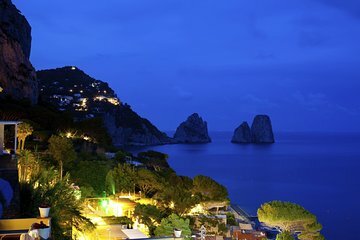 This 2-night experience combines plenty of free time with a day-long guided day trip to Capri. Use your leisure time to explore the Amalfi Coast region, and then cruise by hydrofoil to the island of Capri where Villa San Michele, Augustus Gardens and several beaches await. Accommodation is in a 3- or 4-star hotel in Sorrento, and the tour runs with a maximum of eight people for a small-group experience. We stayed at the Villa Crawford which was a beautiful location. It's a bit outside of Sorrento but not so far as to take a nice lengthy walk to the center of Sorrento. Unfortunately, mother nature did not cooperate with our stay and we were rained on for nearly the whole trip which limited our ability to walk around and made the tour more difficult. It was a LOT of rain. That said, our tour guide Antonino, did his best to look after us and make sure we got to see Capri as best as possible under the circumstances. Even with the rain, the area is breathtaking. One warning about the hotel, do not expect to bring food up to your room. That would not have been a problem if the weather was pleasant and you could have enjoyed the outside eating areas. This was most spectacular. The transfer was fabulous and the guide was fantastic. He met us at the pier and guided us all day long. He was very connected with our private driver, restaurants and he was like a history book regarding Capri. He arranged for everything. It was probably one of the best excursions that we had in our three week stay.